The setting is a post nuclear war society where blue/green skinned, silver eyed human looking robots have become commonplace. The surviving human population are suffering an ever decreasing birthrate and are dependent on their self thinking, self motivated creations for assisstance in trying to rescue the human race. Meanwhile, a fanatical organization ('The Order of the Flesh and Blood') is attempting to stop the robots from appearing (and becoming) too human, fearing they will go from helping to taking over. They are especially distressed when they discover that a scientist is experimenting on human replicas and giving them genuine emotions and memories. 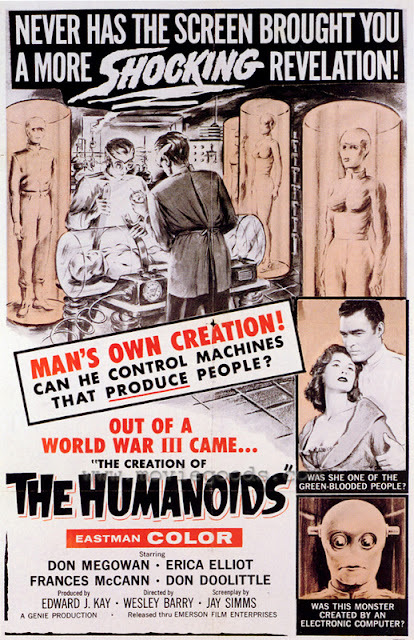 At first glance, there are many things about 'Creation of the Humanoids' that would make it an undesirable watch; the slow pacing, amateurish acting, the fact that much of it resembles nothing so much as a filmed stage play (95% of it could easily become a stage play with almost no change). Yet there is something about this movie (something quite diabolical) that kept me glued to it from beginning to end. This script, breezy and pulpy as it may seem, is extremely and deviously clever. It probes things such as race discrimination, isolation and ultimately even religion. In this way, it almost plays like a (very) low rent version of 'Blade Runner'. This ever evolving story combined with it's basic, yet striking set design makes for an oddly compelling, even hypnotic viewing experience right up to and including it's twisty final plot conceit. 'Creation of the Humanoids' is easily one of my favorite sci fi films. Not everyone will agree (there are those who find this film utterly unwatchable) but for those like me who have fallen under it's spell, it's mysterious charms are impossible to resist. And yes, this was Andy Warhol's favorite film.